Adobe recently released an update to their DNG converter tool that allows it to convert Fujifilm X-T3 RAW files (.raf) into DNG format that’s readable by Lightroom and other editing software. However, I noticed a serious problem when importing those DNG files into Capture One: the colors shift. And I don’t mean shift in a pixel-peeping sort of way, I mean major color shifts in a smack across the face with a large wooden mallet sort of way. First, my computer setup is shown in the image to the right. It’s an iMac 5K Retina with 64 GB, more than enough to handle a single RAW file conversion! Color shift from Fujifilm X-T3 DNG import into Capture One. The image on the left is the converted X-T3 DNG from Adobe DNG converter. The image on the right is the straight from the camera RAF file. I saw a number of posts about this problem around the internet — and some people have erroneously attributed the problem to the new “Sports Viewfinder mode”. But that’s not true because the image above was not shot using that mode. It was shot also with Adobe RGB color space, and not sRGB. So, I started experimenting and believe I found a fix. Or, at least a workaround. Read on. 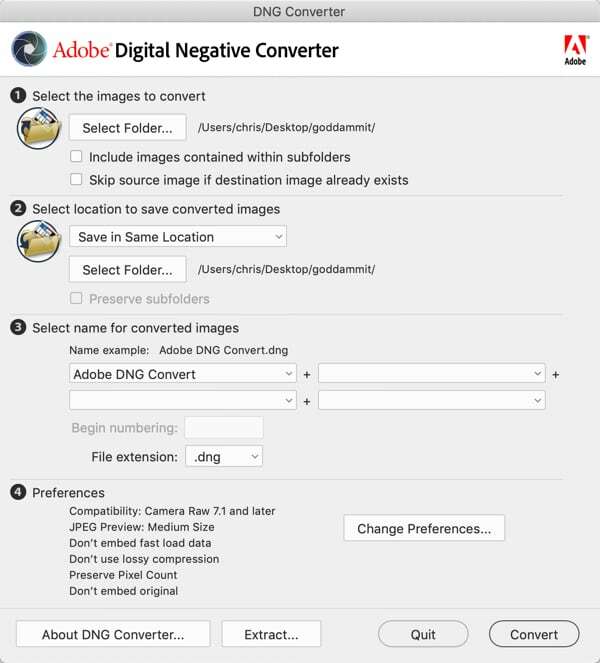 When you go to perform your RAF conversion using the Adobe DNG converter, you need to set your custom DNG compatibility to Linear (demosaiced). This seems to fix the problem and you can import successfully into Capture One and go from there. Click the ‘Change Preferences…’ button. Then, you need to do two things: Select the ‘Custom’ choice from the dropdown menu and choose “Linear (demosaiced). Select the ‘Custom’ choice from the dropdown menu and choose “Linear (demosaiced). Click OK, convert the file, and you’re good to go! You can then import the converted DNG into Capture One without any further issue. Final fixed Fujifilm X-T3 RAF conversion! The image on the left is the now corrected/converted DNG. As you can see, it opens and displays perfectly! Mission accomplished. These RAF files were from a Fujifilm X-T3. None were in any kind of sports mode, though this problem existed with that mode also. I didn’t test every possible setting in the Adobe DNG converter. Rather, the problem occurred with the default settings after I downloaded the software from Adobe’s website. Once I found the fix, I stopped experimenting. I’m a busy dad and don’t have time to be testing this stuff for free for Adobe. There’s probably a dozen people at Adobe’s corporate headquarters that can look into this further. For me, and anyone else reading this blog, these settings will work until they release a fix. My Capture One Pro 11 settings were also default. I downloaded the C1 software yesterday and made no changes to it before this all blew up. The version of Adobe DNG Converter I used was 11.0. I downloaded it from this page. I didn’t test this on a PC. Just on my iMac with the specs listed at the top of this article. I’d be interested to know if anyone on a PC ran into this issue. I’ll be the first to admit that I don’t know the first thing about DNG conversion language, linear demosaicing, etc. So, take my advice cautiously, particularly before converting a bunch of work photos! But, it worked for me, and I’ll be doing it until Adobe releases a fix. Always save your original RAF files though — that much I’m certain. I trust the DNG format as far as I can throw it, and hard drive space is dirt cheap — so I keep every RAF file always always always. If you have any updates to this situation, feel free to contact me and I’ll update this article accordingly. Hope this helps! Feel free to leave a comment below.